Welcome to our February ‘love-ly’ Blogging Friends Blog Hop! I don’t know about you, but I’m still trying to figure out how January went by so fast! Here we are, now into February, and of course that means that the big celebration is LOVE! I know, some people focus on ‘Valentine’s Day’, but to me, that seems so restrictive to a ‘sweetheart’. Of course, not everyone has a ‘sweetheart’ when Feb. 14th rolls around, but we all have friends and family whom we love, and I think it’s always important to celebrate those special connections. If this is your first time visiting a blog hop, just sit back, relax and enjoy the fabulous projects our newly expanded group of blogging friends! We have a number of new friends added to our group, so you are in for a real treat! Each of us is linked to the person in front and behind us, so all you have to do is click on the ‘Continue’ button at the bottom of each blog post, and you’ll be taken to the next page. In the event of technical difficulties – meaning the internet gremlins have been at work – go to the bottom of the page, and you’ll see a complete list of all participants in order, so you can continue on that way. My first project was inspired by one of my team members, Chantal. She had spotted this cute project that she wanted to make for her coworkers, so she asked me if we could get together and put one together, then she would make the rest on her own. The main part of the mailbox is made using the Baker’s Box Thinlits Die; you create it as normal, except you cut the ‘door’ for the mail (treats) to fit in/out. Then a piece of cardstock is added to fit arcing over the top and down both side, to create the top and feet for the mailbox. I used the retired Curly Label Punch to create the feet, but you could also use the Decorative Label or Label Bracket punches for the same look. The small Silver Glimmer hearts were cut from the Mini Treat Bag Thinlits, and I also used the Silver Glimmer paper to cover the handle of the mailbox door. I used last year’s Valentine’s Paper Pumpkin stamp set for the stamped heart and sentiment; I cut that out by hand, and layered it on top of a punched heart in Blushing Bride Cardstock. You can see on this picture of the back of the mailbox that I did the same; layering the Paper Pumpkin stamp with the punched pink heart, and Silver Glimmer Hearts. 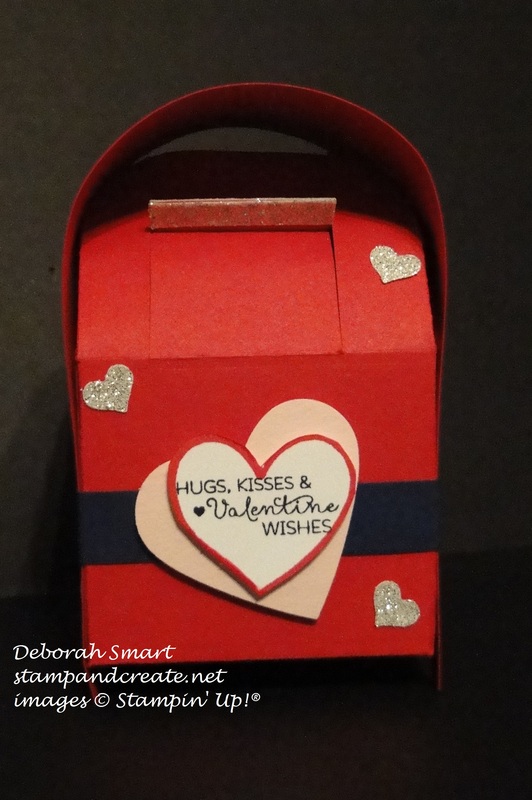 This little mailbox holds lots of sweet treats for your friend, or sweetie! I prepared my card base of Blackberry Bliss cardstock, layered with a panel of Mint Macaron cardstock. To create the stamped image, I took a piece of Watercolour Paper, stamped the Big Dipper from Going Global and the couple from Beautiful Ride in Versamark ink, covered them with White Embossing Powder, then heat set the powder. I then used a Post-it Note to mask off the grass area underneath the couple, and using Sponge Daubers created the sky using Mint Macaron, Blackberry Bliss and Night of Navy ink pads. I removed the mask for the ground, the masked off the sky, and sponged the ground using Crumb Cake, Tip Top Taupe and Old Olive ink pads and Sponge Daubers. After sponging, I used some paper towel to rub the excess ink off of the embossed images. Next, I used my Aqua Painter and ink pads in Real Red, Night of Navy, Daffodil Delight , Tip Top Taupe and So Saffron to colour in the couple’s clothes and hair. I tried to add a shadow under them, but just ended up making it look like they are sitting on a hill! *sigh* Oh well; I will need to practice that more, obviously! The sentiment is from the Picture Perfect stamp set; it’s stamped in Blackberry Bliss ink onto Whisper White cardstock; it and the Blackberry Bliss layer below it had banner ends created using the Banner Triple Punch. 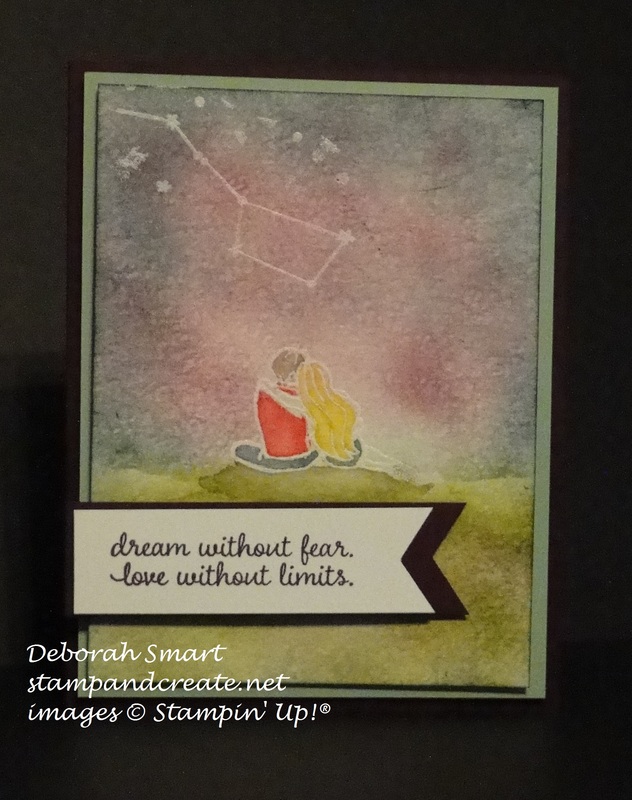 The sentiment and image panel were layered onto the card base using Stampin’ Dimensionals. I hope you’ve enjoyed seeing my projects for this blog hop; if you have time, I would love to read any comments you’d like to leave for me! Now, you can click on the image below to see what wonderful projects Jessica Mink has in store for you! Until next time – happy stamping, my friend! 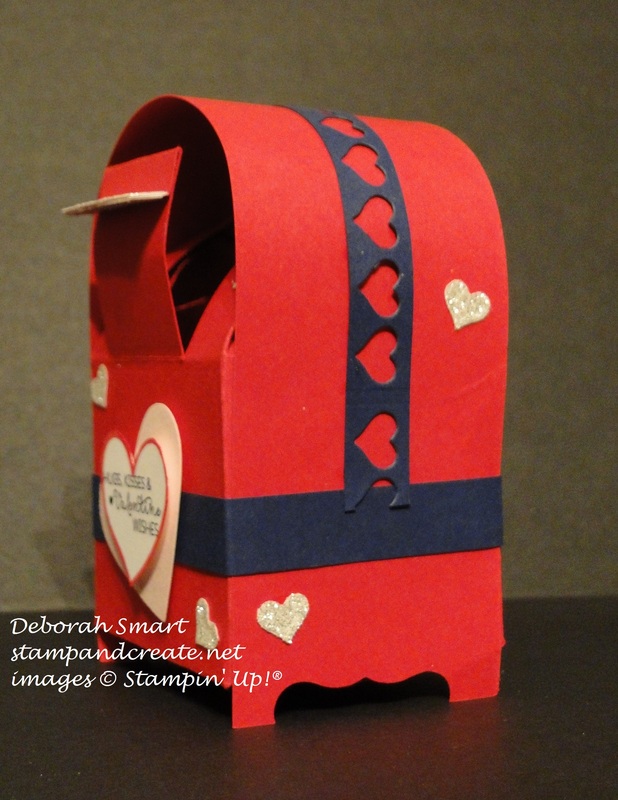 Next Next post: Fun Paper Craft Crew Sketch Challenge! Love the coloring on the sky and the embossing resist. The mailbox is adorable. Very clever use of the bakers box. Very, very cute mailbox! What a wonderful idea! I love it when something is manipulated into another idea! You get more use of these dies this way!! Super cute mailbox! I love when such creative people find another way to use a product. I love the watercoloring on your card! I guess great minds think alike 🙂 I love your mailbox, too! You always inspire me with your 3D projects! What a cute idea!!! I love these! Love your projects Deb! You always knock it out of the park! TFS! Aww, thanks Michelle! I’m so glad you liked my projects; thanks for taking the time to leave such a nice comment! Adorable mailbox! Great card! Thank you for sharing. Happy to be hopping with you! Thanks for the lovely comment 🙂 So glad you enjoyed my projects! Oh my god! Love that mailbox! And that card, is gorgeous. 🙂 Thanks for your comment, Lorene! 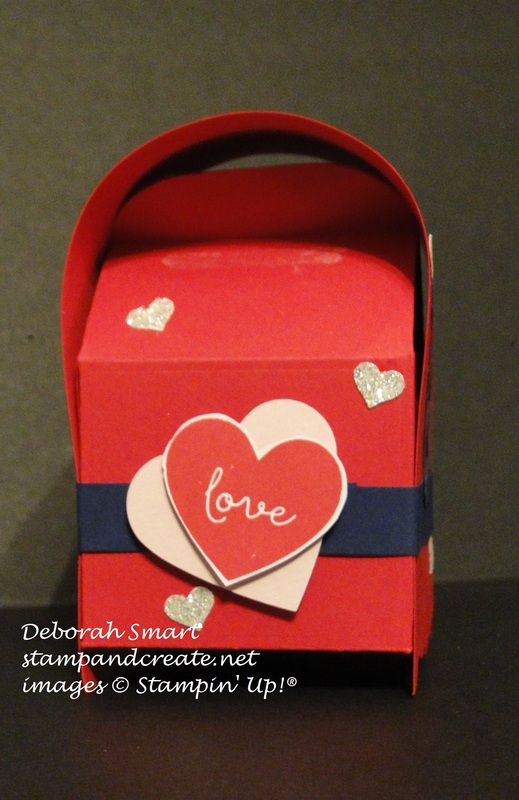 Love your projects and the mailbox is so sweet! Thanks for sharing. Love, Love, Love it. Did I tell you I LOVE this! Thanks for sharing! Great projects! I love the mailbox. Happy Blog Hopping day – glad to be joining the fun!